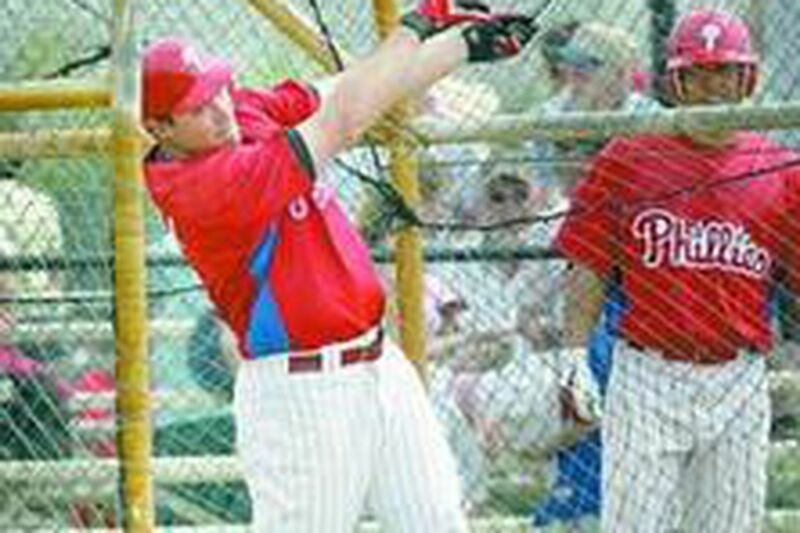 Pat Burrell fouls one off in batting cage, without Mike Schmidt close by. CLEARWATER, Fla. - Mike Schmidt has a fever about Pat Burrell's hitting. And the only prescription is more contact. Schmidt reported as a special instructor at Phillies camp yesterday, but his first point of business had nothing to do with power hitting. Rather, he sought to clarify the comments recently published in Dayton (Ohio) Daily News concerning the strikeout binges of Phillies leftfielder Pat Burrell and Reds slugger Adam Dunn. He even prepared a written statement for both the press and Burrell, with whom his infrequent contact has ended; he toyed with asking Burrell to attend yesterday morning's annual Schmidt news conference. Schmidt didn't ask Burrell. He saved himself the rejection. The source of angst stems from Schmidt using the word "mediocre" 2 1/2 weeks ago in describing Burrell's and Dunn's career production so far. What he meant, Schmidt said yesterday, was if they struck out less, their results so far would look mediocre compared to what their results would be. But, yes, Burrell still strikes out too much, Schmidt said - just like Schmidt did; he ranks seventh on the all-time list, with 1,883. And, said Schmidt, striking out in front of a rabid home crowd can wear on a fella. Burrell's spotty performance last season made him the chief object of fan derision at Citizens Bank Park. "I can help Pat . . . I'm sure Pat is not as comfortable as he'd like to be in that stadium," said Schmidt, who endured similar trials at Veterans Stadium. "And I've gone through it. My advice is: more contact." Burrell seems unreceptive to advice and uninterested in anything Schmidt has to say - or write, for that matter. "There's no point," Burrell said. After all, this is the second time Schmidt has issued a statement of regret concerning his comments on Burrell's hitting. He criticized Burrell for being unreceptive to advice during Burrell's atrocious 2003 season, then issued a statement saying he regretted his comments. Burrell shrugged that one off. He simply ignored this one. Surely, that disappointed Schmidt, who sees himself in every one of Burrell's 1,017 career whiffs. "The guy I identify with on the team is Pat," Schmidt said. "I don't know if Pat feels that from me. We're not that close. In fact, I tried calling him a couple of times. He didn't return my phone calls. Maybe I didn't use the right alias or something. I reached out. Maybe he didn't want to accept. "I root for him a lot. I see myself in him, so much. Approach to hitting. Having to deal with strikeouts. Adrenaline factor affecting your ability to hit. Wanting to [produce] so bad in front of the Philly fans. "I know he's the guy on the team who has to accept the brunt of the [negativity] in the ballpark now. He's got a lot of pressure on him. To have me commenting on him . . . I'm sure he'll feel it will only add to that." Schmidt only wishes he had listened to what instructors were telling him in Year 1 of his career instead of waiting until Year 15. That's when those long walks back to the dugout having left the runner stranded with another "K" became less frequent, and so did the catcalls and boos. "When I was able to cut my strikeouts from 160 to 80, there became a middle ground. I wasn't walking back to the dugout as much," Schmidt said. "If you're running out a ground ball or running out a fly ball or lining out to somebody, slowly but surely the fans start to understand: This guy gave us a tough at-bat. It doesn't look like you're giving a tough at-bat when you strike out." Less than 7 years into Burrell's career, said Schmidt, "I'm not sure that Pat is receptive . . . Good hitters can be stubborn. At some point, down the road . . . [you] realize the game can be a lot more fun if you figure out a way to make more contact." That way, for Schmidt, was swinging down on the first hard pitch he saw; literally trying to hit the ball into the ground instead of trying to lift it out of the stadium. Schmidt adopted that method before the 1986 season and hit a combined .291 with 72 homers, 232 RBI and just 164 strikeouts - probably his most consistent, if not the most productive, consecutive seasons. In 1986, Schmidt was 36 when he won his third National League MVP award. Burrell is 30. Schmidt watched how much teams pitched around Ryan Howard to get to Burrell in the final 2 months of last season. It did not surprise Schmidt, who knows the feeling. "I always felt the other team kind of wanted me up there. I didn't like that feeling. I didn't feel complete," Schmidt said. "I could have had a lot more fun if I had given a crap about what I hit. I [eventually] wanted to be a guy who could hit you a ground ball up the middle with a man on second and two out. I wanted that in my repertoire. I didn't want to be a guy who rolled over to third base if you threw me a slider in a pressure situation. I didn't want to be a guy who had a lot of holes, who was easy to strike out: Bust him up and in, throw him a slider away and he'll wave at it." Schmidt contended that teams would rather face him than, say, Greg Luzinski. Sure, Luzinski struck out plenty, but he also hit .300 three times. Schmidt never hit .300 through a full season. In 1986 and '87, though, he became much more proficient. "First ball thrown up there hard you see on the right side, you should smoke," Schmidt said. Suddenly, he said, "I wanted to be there with the game on the line. I cannot tell you I wanted to be there with the game on the line earlier in my career. I felt vulnerable." "I wanted to fight every guy in that stands that was booing me." Yesterday, Burrell indicated nothing at all. Schmidt did not watch Burrell hit; he stayed a field away, where Howard hit. Burrell did not seem affected by Schmidt's presence. In fact, he had a hard time suppressing a grin as the assembled fans cheered his efforts loudest during baserunning drills. It does not appear any sore Burrell feels is festering. Certainly, little of what Schmidt suggests for Burrell differs from what hitting coach Milt Thompson and Phillies manager Charlie Manuel already stress to Burrell. None of them believes Burrell's long, powerful stroke needs to be rebuilt. Manuel believes that, during Schmidt's scheduled 10-day stay, Schmidt and Burrell might heal their relationship.